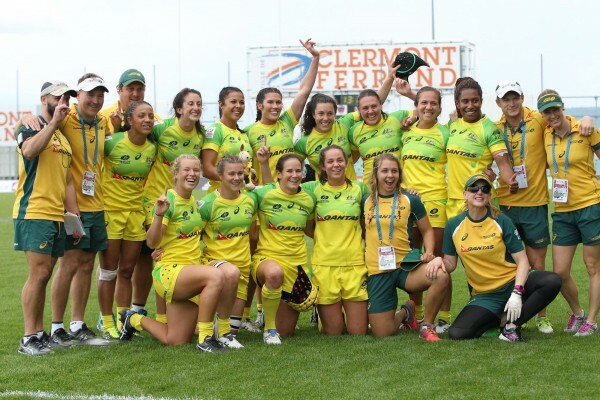 In her first blog for Scrumqueens.com, Australian star Chloe Dalton tells us about the huge reaction back home to her side's World Series win recently, and why the squad won't spend too much time basking in glory. A question we’ve been asked multiple times in the past week. To be completely honest, I’m not exactly sure of the answer to that. At first thought, it’s a pretty incredible feeling and a slight sense of reward after the ridiculous strain we put our bodies under on a daily basis. Then again, there’s a heck of a lot of pressure that comes with being number one. So I’ll let you know when I work that one out. To be crowned champions of the 2015-16 World Series, we had to place 6th or better at the final tournament in Clermont-Ferrand, France. The week in the lead up to the tournament had a surprisingly relaxed feel. Besides having to avoid the appalling smell of freshly baked croissants wafting from pastry shops on every single corner, it was a perfect location for the final round of the series. Day one of the tournament began well with three wins over Fiji, Ireland and the passionate home team France. Straight into the recovery boots, ice on the sore things, a good nights’ sleep and we were feeling ready for a big day two. A win over Spain in the Quarter Final would confirm the World Series win. Heading into the game, there wasn’t any sense of assurance that the series was ours, yet we were confident in our preparation and focused on executing our game plan. We played one of our best games of the weekend to take out the win 35-0. And we had done it. We had made history, becoming the first ever Australian team to win a World Series title. We had a couple of minutes to celebrate on the field and smile for the paps. Then it was straight back into the change-rooms to recover and prepare for a semi final against rivals New Zealand. A convincing win in the semi final set up a Cup Final against Canada. The fan base back home continues to grow, not only with family and friends of our squad, but with die-hard rugby fans, and some fresh ones too. A true testament to the bloody top notch rugby on display at each tournament. A huge thank you to those of you down under (where the clocks seem to be conveniently opposite to the rest of the world) who consistently wake up in the middle of the night to yell at your computer screens. It’s been crazy to see the influx of media articles, news reports, and radio coverage celebrating Australia’s first ever World Series title. It is a huge honour in itself to put on the Green and Gold, so to be part of such a huge achievement felt surreal. I’m not sure whether it really has set in yet. A part of me hopes it doesn’t. Because now the time comes to prepare for the big dance. As incredible as it is to win the World Series, the pinnacle is undoubtedly Rio 2016. Rather than basking in the success for too long, all our hard work is now focused on returning home with that big chunk of gold around our necks.